With the kids' heads deep in books for final exams week and eight days in between games, I think it's a good time to take a look back at the first month of American's season and some key takeaways. 16.9ppg (team-high) on 51.3% E-FG. He's 53% on twos; room for improvement: 30% on 3s. 4.3rpg, impressive for a 6-1 guard. 2.9spg, which is 9th in the country. His steal percentage of 4.7 is 31st nationally. 37.2mpg, which is tied for 5th nationally. Even more, his production hasn't slipped late in games. Nelson's assists-to-turnovers ratio (2.8/2.6) could and should be improved, and anyone who's watched his handle knows that he will get better there. I knew about 2 minutes into the Maryland game that Nelson was a keeper when he fearlessly attacked the Terps bigs for AU's second field goal. His clean steal of possible All-American Melo Trimble and finish at the other end cemented it. Mike Brennan has repeatedly praised Nelson's high school, championship-winning upbringing at St. Augustine as a reason for his freshman's poise on the court, and it will be even more beneficial for the Eagles once Patriot League play starts and the games really matter. The biggest question going forward: Will the freshman who has already played four 40-minute games fatigue in January or February? If you saw American's most impressive outing of the season Saturday, its 77-62 picking-apart of Youngstown State, you surely noticed that sophomore Lonnie Rivera made quite the impact in 14 minutes. He shot 4-for-4, scoring nine points, grabbed four boards, and was all over the court. On one sequence, Rivera snatched a defensive rebound, dribbled the length of the court, made a pass, got the ball back, and finished a jump hook with his off left hand. Rivera started a season that held great promise for him injured, which, according to Brennan, set back his development. The result was not playing in six of American's first eight games. But now, AU's coaching staff has no reason not to consistently play a guy who is much more athletic than starter Leon Tolksdorf, who might be American's best finisher at the rim against bigs, who can defend and rebound well, and who even — finally — showed his shooting touch with a corner 3, his first attempt from deep of the season, up against the shot clock Saturday. If American's to challenge for the league, Rivera will be a key cog — whether off the bench or eventually starting. For much of the past month, Delante Jones could be labeled a disappointment. Let's not forget that he came out of last season red hot — scoring in double figures his last 10 games, including that game-winner at Holy Cross. That helped set high preseason expectations — including Patriot League first-team — for a player whom Brennan has always spoke highly of. Jones has struggled for a variety of reasons. He's worked a lot on it, but his vision and passing leave plenty to be desired. His 24.5 turnover rate is second worst on the team, and he has four games with at least four giveaways. For a player who has used 28.2 of American's possessions, better ball security is a must. Jones has also struggled with his shot. He's shooting just 30% (11-36) from 3, a steep drop from his 36-percent perimeter work last year, and is just 27% on 2-point jumpers. The good news is it's still early and there are some logical explanations for Jones' struggles. He's gone through a couple stages of this sophomore adjustment. First, everyone thought he would definitively be the man for the Eagles and he'd have to deal with that pressure. Jones said in preseason, “It’s gonna be hard. It’s definitely gonna be a whole new experience. … I’m as ready as I can be I guess but I guess you don’t figure out until you play.” Then, Sa'eed Nelson happened and while Jones still uses the most AU possessions, it doesn't seem that way. Nelson has the ball in his hands with the shot clock running down. So Jones is adjusting to that. Despite 0-for-5 shooting from 3 vs. YSU, Jones looked as good as he had in three games — attacking the rim with a variety of moves to both sides of the basket. He also rebounded and defended. What AU can't afford going forward is for offensive poor play to affect Jones' defense, which has been an issue last year and into the early part of this season. Andrija Matic's minutes through nine games: 21 total. What happened is simple. GW transfer Matt Cimino unexpectedly became eligible and freshman Mark Gasperini (who takes a team-high 31.3% of AU's shots when on the floor) has been really good, thus relegating Matic to a third big role. Also unexpectedly, Leon Tolksdorf started at the four and while he's struggled shooting (23% from 3), he's been otherwise serviceable, and Charlie Jones has filled the rest of those minutes at power forward. Is it still possible we see Matic in a consistent role? Barring an injury, doubtful. As many have pointed out, the AU coaching staff wants to give Cimino — ranked 78th nationally by Scout coming out of high school — a real opportunity to play his way into shape from the foot injury that kept him on GW's bench last season. While he hasn't been great thus far (2.1ppg, 1.6rpg in 10.3mpg), he's shown flashes with his sweeping hook shot and outside quick-release from 3. Brennan also called him a better defender than Gasperini (his 3.1 block rate, while paltry, is best on the team). All this to say that with Gasperini set into the main big man role, Cimino improving, Rivera likely trending upward at the four, and Charlie Jones Mr. Consistent, Matic — while intriguing — will likely be saved for emergency situations during league play. This is a much better American team that's still figuring out what it is, sure, but has much more of an identity than the 2015-16 group at this time. A year ago, and even in mid-January 2016, Brennan admitted to trying anything to try to get his team going. At one point, we legitimately wondered if the team would win a league game. The Eagles, of course, made a huge turnaround to win nine. With this team, I'll surprised if they don't win one of their first two. AU has a star-in-the-making in Nelson. Will he struggle at times? Sure. But don't expect long funks. Delante Jones will be better in league play as he settles into his shifting role. James Washington is much better than a year ago in all facets — he's locked in defensively, his handle is leaps and bounds improved (he has a team-best 8.3% turnover rate), and he's finishing at the rim over bigger defenders (63% at the rim). Gasperini (12ppg, 5rpg) has already become that big the Eagles can throw it to early and often when nothing else is there. I mentioned Rivera and Cimino, and we know what Charlie Jones will bring on both ends. 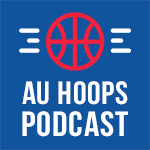 A) Can AU and its small lineups rebound with and defend against the likes of Lehigh and Tim Kempton and Bucknell and Nana Foulland? AU has allowed opponents an ORB% of 29.6 (middle of the pack nationally). The Eagles got crushed on the boards by the likes of Maryland and Akron; but they also showed how they can win the battle on the glass Saturday, with six players snaring at least four rebounds. That's something to watch going forward. And how will AU defend the Patriot League's best? It's no secret that we have yet another American team sans a shot-blocker. Brennan's never really been one for zoning, either, particularly with a young team. B) And how will AU play against zone defenses? The Eagles were a mess vs. a soft Howard 2-3. Brennan said after the blowout loss that the silver lining was getting to experience a zone. I'm sure American will see similar coverages in the Patriot League. Senior Jalen Rhea doesn't have much of a rotation role right now, but I wouldn't be surprised if he helps bust a zone — particularly if, say, a Navy goes to its 1-3-1 — with corner 3s. Keep an eye on how many non-man to man coverages teams throw at AU.